PROTECTING PORT TRUCKERS: Bill would defend owner/operators from “exploitative truck lease or rental arrangements." Lawmakers claim lease-to-own contracts force truck drivers to work long hours for little pay. Proposed legislation sets baseline work standards for port truckers. Report: Trucking companies in Southern California force independent drivers into lease-to-own programs. 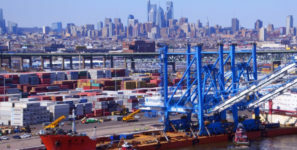 Proposed legislation in the United States would require the federal government to investigate companies at ports taking advantage of their workers, according to a report in USA Today. Lawmakers in the US House of Representatives claim that lease-to-own contracts force truck drivers to work long hours for little pay. Two federal bills tackling such lease-to-own contracts were put forward last week. A separate bill, The Clean Ports Act of 2017 would let US cities and local governments regulate port trucking companies, something retailers and trade groups have lobbied against. According to the USA Today report, trucking companies at Southern California ports avoid paying for new trucks by forcing their independent drivers into company-sponsored lease-to-own programs. Drivers can work 20 hours a day for “pennies,” said the report, and may still owe their bosses on payday after expenses. Truck modernization is underway at California ports since a law banned aging and polluting trucks from Los Angeles and Long Beach ports. Thanks for sharing this post! It’s so important that drivers aren’t taken advantage of. Though I don’t believe that the The Clean Ports Act of 2017 is the right solution, there is some type of solution to be had with more discussion and by bringing up the issue as you are in this post.